Closed Cell Cooling & Chiller System | Whaley Products, Inc. 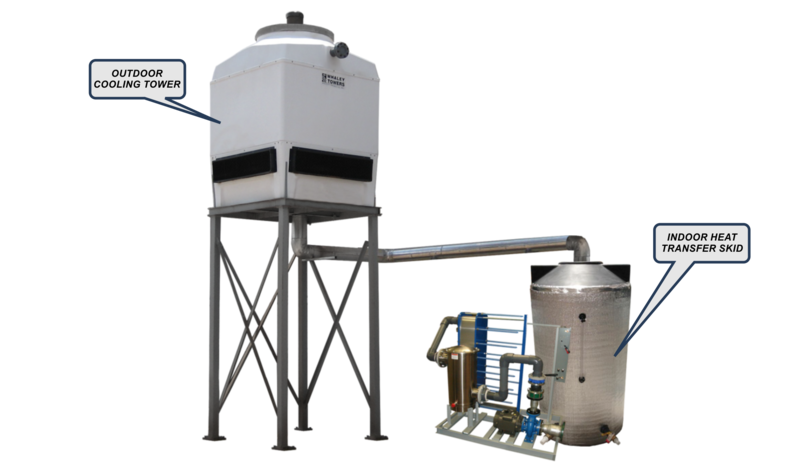 The need for a closed loop cooling tower system that operates at the industry's highest possible electrical efficiency and water loss rates led to the conception and subsequent design of the CLIO-Series. CLIO-Series systems consists of an elevated outdoor evaporative cooling tower which gravity feeds to an indoor cooling tower water reservoir and isolation heat transfer skid. In addition to providing operation electrical efficiency and low water loss, CLIO provides a zero electricity freeze protection that works in literally any and all harsh site conditions. No basin heaters or other heat tape/tracing is required. In the event of a power outage, whether it be a brown-out or black-out, the outdoor cooling tower simply drains to the indoor holding reservoir. This reservoir is typically installed in a mechanical room, or on a production/warehouse floor of the facility. The reservoir is typically accompanied by a heat transfer skid. This heat transfer skid could have a variety of components including control panels, pumps, valves, filtration, heat exchangers, or evaporators. Another benefit of Whaley's cooling tower systems is the fact all WPI cooling towers' overall weights are substantially lower than conventional metal (galvanized or stainless steel) cooling towers. Galvanized cooling towers tend to rust from the inside out over time, and stainless steel cooling towers are dramatically more expensive then any material. WPI's FRP (fiberglass reinforced polyester) cooling towers are made from the same material sporting boats are made from. This FRP material make-up allows WPI to offer a cooling tower that can withstand as much heat, ultraviolet sun, rain, snow, and wind that mother nature can throw at them.